Association TRENDS is owned and operated by the team behind major advocacy resources and tools. Our history working with associations and the government relations communities mean we uniquely understand your need to advocate on behalf of your members and industry. Scheduling and running a fly-in is like herding cats… but worse. 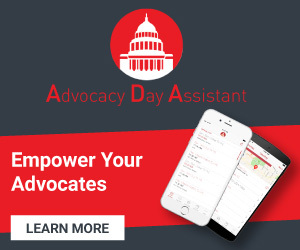 The Advocacy Day Assistant App affectionately referred to as “Ada” helps you schedule and update constituent meetings in real time, provides attendees with Member information, fly-in talking points and gives you direct access to attendee feedback. Available for Federal and state level fly-ins. Click here to for more information on “Ada” or schedule a demo using the form to left. Whether you’re giving out congressional handbooks at your fly-in or using them as gifts for PAC donors, a custom handbook allows you to provide your members with a useful, year-round resource to advocate for your associations. Handbooks can be completely customized including the front and back covers, custom inserts and legislative aide indexes. Click here to for more information on custom handbooks or use the form to the left to request a quote. Getting your message directly to Members and Congressional staff can be tricky. We offer two unique resources to deliver your message. For rates and more information complete the form to the left. US Congress Handbook: Congressional Edition – Delivered to every office on the Hill, the White House, Pentagon and Supreme Court. Ad positions available throughout the handbook. ROVER – The ROVER app is utilized exclusively by Congressional staff and federal government employees. We offer in-app advertising positions with target options available by party, issue area, committee and more. Whether your internal advocacy team needs training or you need to put together a custom training for your member advocates, TRENDS has the training resources you need. Click here to view our webinar library or use the form to the right to request more information about custom training. AT’s sister company, Lobbyists.info, maintains the largest available database of federal lobbyists and advocacy professionals at associations, corporations and firms. Visit www.lobbyists.info to learn more about this government relations data resource. Check out our free resources on advocacy www.associationtrends.com/resources-advocacy. Want More Information on AT’s Advocacy Services? By downloading this free resource, you are also registering to receive email offers and product updates from us. Simply click unsubscribe at the bottom of any email if you would like to discontinue delivery.